Cooking with fresh basil is a wonderful sensory experience that inspires creativity in the kitchen. Basil elevates dishes and complements a variety of foods and other herbs, including cheeses, garlic, lemon, olives, onions, oregano, rosemary, sage, and tomatoes just to name a few. One popular summer salad that basil is featured in is the Insalata Caprese, an amazingly simple yet flavorful salad made by layering sliced mozzarella, sliced tomatoes, and basil leaves. The ingredients are then seasoned with salt and drizzled with olive oil. It is as pretty as it is delicious! From basil vinaigrette to pesto to tomato and basil frittata, basil is by far one of the most popular herbs used in the kitchen. It’s also beneficial to health, thanks to the flavonoids and oils that are found in this flavorful herb. Orientin and vicenin are two water-soluble flavonoids found in basil that provide protection at the cellular level—protecting cell structures and chromosomes. The oils found in basil have been shown to provide protection against unwanted bacterial growth. Basil is also known as an anti-inflammatory food and may offer symptomatic relief for people with inflammatory health problems. 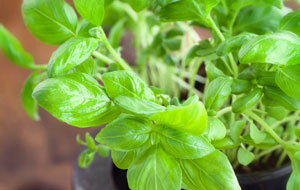 Nutrient-wise, basil is an excellent source of vitamin K and a very good source of calcium, iron and vitamin A.